Rochester, N.Y., April 2, 2018—The George Eastman Museum has announced that its popular Eastman Entertains: At the Movies, will be on view from Tuesday, May 8, through Sunday, May 20. For two weeks only, a spectacular array of creatively styled table settings and floral arrangements inspired by popular motion pictures—including My Fair Lady, A League of Their Own, Steel Magnolias, and The Goonies—will be displayed throughout the mansion of entrepreneur and philanthropist George Eastman. citizen, Eastman was accustomed to hosting guests, and he ensured that each luncheon, dinner party, and event was a memorable experience for them. This display continues to honor the tradition of entertaining at the mansion that Eastman cherished. 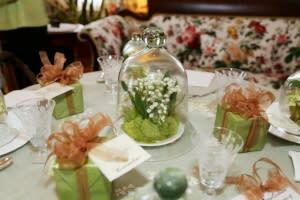 The 23 creative tablescapes and arrangements throughout the National Historic Landmark mansion were designed by Eastman Museum Council members, local garden club members, florists, or specialty retailers. As a complement to the displays in the mansion, the Dryden Theatre will screen five of the films that provided inspiration for this elegant and elaborate display. Tuesday, May 8, 7:30 p.m.
A special preview party is scheduled for Monday, May 7, from 5:30 to 7:30 p.m. Tickets are $40 general or $100 patrons— patron level includes a pass for all films in the Eastman Entertains film series. Reservations must be made by Tuesday, May 1: (585) 327-4935. Guests will enjoy prosecco, wine, hors d’oeuvres, and the opportunity to see Eastman Entertains: At the Movies before it opens to the public. Eastman Entertains is presented by the Eastman Museum Council and the museum’s Landscape Committee. Admission is free to members and included with general museum admission.